The unsurpassed beauty that is the music of Sumerland is finally available on their new EP, "And all is always now". Sumerland is Dorien (vocals, guitar), Marshall (keyboards), David (bass), and Enrique (percussion), and I have been enjoying their live shows for the past 2 years. I was completely thrilled to finally receive a copy of their new EP, released as a prelude to their upcoming CD, which still has a month or two of final production and mixing to do. 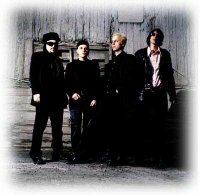 The band is presently seeking label support for manufacturing and distribution of the upcoming CD; and are waiting for "divine intervention" to name the impending CD. The 3 tracks on the EP are "Circle Dance", "Exalted City", and "Morpheus (Repraise)". I asked the band why they chose these particular tracks, and Marshall replied, "There were two important factors in determining which songs would appear on 'And all is always now': First, because we have carefully considered and based our production and mixing of the full length on a musical journey or story line, we did not want our listeners to become too familiar with material that is best taken in context with the album as a complete work. Second, because of the timing with our Sol Invictus openings, we thought these three tracks would be appropriate." David adds, "The reasons we picked these 3 songs are many and vary for band member; but the final track (morpheus repraise) is on there because it is the only place (except live shows) that this song will appear in it's entirety. It will serve a completely different service on the full length." Marshall states that these three tracks will be included on the full length: Circle Dance and Exalted City will be only slightly remixed, while Morpheus Repraise is being extensively edited. The first track, "Circle Dance", also appears on the recently released "Ramen Holiday" compilation, and Dorien states that the lyrics for Cirlcle Dance were inspired, in part, by the cult classic film "Wicker Man" in which children were dancing around the maypole on Mayday. The movie was filmed on a secluded island (Summerile). There were several scenes of pagan rituals and naked virgins dancing over fire. Dorien adds, "The music came to me after one of those zen-like romps through the forest on a very blissfull sunny afternoon (not very goth)." The track "Exalted City" not only features the deep vocals of Dorien, but additional vocals done by Enrique and Marshall, which creates a wonderful fusion. Added to that fact, is the exotic sounds of Enrique using a "bow" on his guitar. I have seen him do this several times during the live shows; so I asked the band "what, exactly, IS that thing"?!?! Marshall informs me that Enrique is bowing his guitar with a metal rod during the first half of the track. The same rod serves as a slide for the last half of the track. There are also keys, and bass feedback in that space of music. Dorien explains that Exalted City was the result of spontanious inspiration that occured during one of the bands rehearsals. The music happened accumulatively, the lyrics have to do with recognizing a "divine plan" in the midst of heartache. On Morpheus, I wondered if there are particular lyrics, as it sounds to be more of a chanting. There is also a wonderful piano part, which Marshall informs me is based on "The Blessings of Morpheus", a track which will be featured on the full length. As for the chant, "...it's mostly an improvised chant, though you will hear a few lyrics from 'The Blessings..." . David feels that Dorien's lyrics often come from the other side, "this is a fine example of that." Dorien explains, "the chanting is, well, I have no idea where that came from. If I recall correctly, I was too loopy to be singing actual words". I would suggest you pick up a copy of the EP as soon as possible, as I'm informed it is currently available only at shows, or the Sumerland web site (www.sumerland.com), and it is limited! This EP is extraordinarily beautiful. If the full length is to be the journey, then "And all is always now" is certainly an enlightening passage.